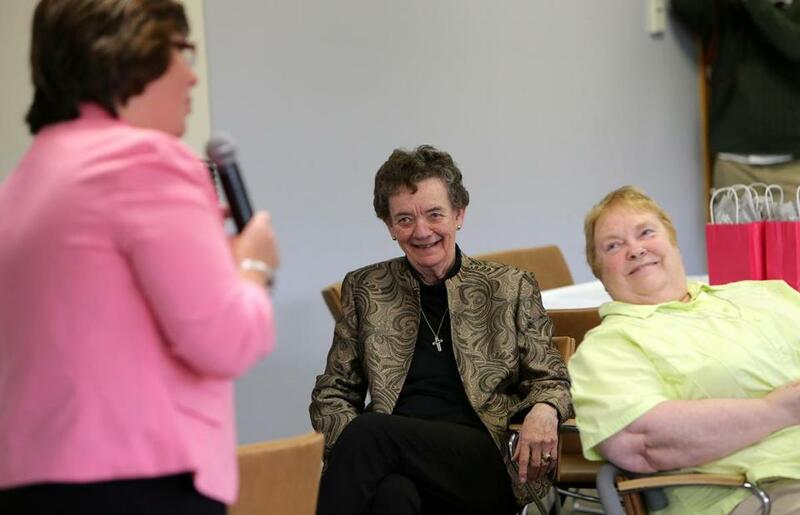 Sister Ellen Powers (center) and Kathy Cronin, who are both retiring after four decades of working in Catholic education, listened to Saint John Paul II Catholic Academy principal Kate Brandley at a reception hosted by the archdiocese honoring 11 longtime Catholic school teachers. For Sister Ellen Powers, it ran in the family. Of course she would be a teacher: Her mother was, her father was. And so she would be an educator, too. For 42 years. Christina Meaney knew her calling by the time she got to elementary school. She watched her teachers struggle to explain math to her classmates. So she showed her teachers a different way to do it. After she finished school, Meaney taught for 20 years. Powers, of Saint John Paul II Catholic Academy, and Meaney, of St. Augustine in Andover, were among 11 retiring teachers, administrators, and staff that the Archdiocese of Boston Catholic Schools honored at a Mass and ceremony Thursday. Together, they spent 318 years in Catholic education. “It’s because we pay them so well,” said Kathy Mears, superintendent of schools for the archdiocese. She was joking. And it is about more than academics, Powers, 75, said. Bishop Peter Uglietto, vicar general of the Archdiocese of Boston, struck the same chord during the Mass. “We’re trying to get them to heaven and Harvard,” she said. And the Catholic school community gives back, Emde, 67, said. “You become part of the family,” she said. Charlotte Flynn, who taught kindergarten at St. Augustine, said she could not have found the same community feeling anywhere else. That community was there for her, through two deaths in her family — first her husband, then her son. Having coworkers to lean on every day made all the difference. Students feel it, too, Powers said. And a student at her school agreed. And, Mears said, they probably aren’t finished. “They will enjoy their retirement, but all of them will do something at their schools for a while,” she said. Reis Thebault can be reached at reis.thebault@globe.com.